We have this room on the back of our house that when most people enter, they immediately fall in love with. 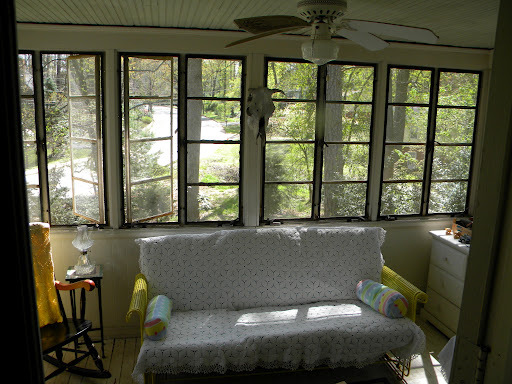 We call it the sunroom. It is three walls of 4′ tall windows. Considering the room has a ceiling height of 7’6″, that’s alot of window. 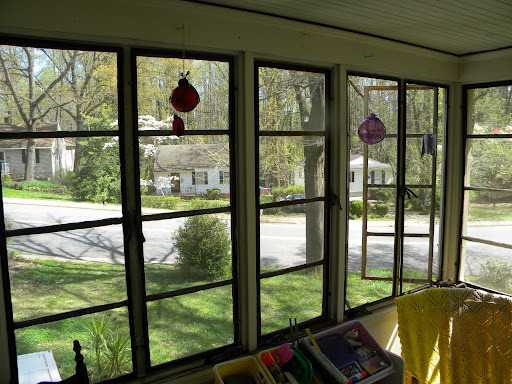 The windows are old steel casement windows. Some of the don’t quite shut anymore, some don’t open anymore. They are quite simply glass and metal and energy efficient is not one of their qualities, so we can only use the room three quarters of the year. But for those three quarters of the year, it’s lovely. And the quarter of the year we can’t use it? Well, it still gets used, just not in the same way. That’s when things start collecting out there, because I can throw something back there, shut the door and out of my eyesight it goes. It also works as a fantastic walk-in fridge when it’s cold enough. It’s really sort of a glorified porch, one that stays dry. The room faces south, with windows on both the east and western walls. It has a glider sofa, glider chair, stereo and ceiling fan, everything you need to hang out. Every spring I deep clean it, wiping down the floors, walls, ceiling, getting rid of all the dust that accumulates in there, the spider webs, the stuff that collects. I do a decent job of staying on top of that room the portion of the year we use it, but then, every spring when we first open the room back up, I am taken aback by the state of things. Stashing things you don’t know what to do with and closing the door can add up. In the last few years, Edie’s art supplies have found themselves a home out there, so there is now an easel and bins of paints, pastels, crayons and other implements of artistic endeavors out there. She works out there year round, not letting the chill bother her. I have to say, having just spent the last 24 hours cleaning it and putting it freshly laundered slipcovers back on the furniture, it is a dreamy space. Various things to do, read and eat. Beautiful! I love a room with lots of light. And what a convenient place to store stuff until you figure out where it actually goes. That figuring is always a problem with me. Congratulations on getting the room ready for nice weather! I'd be hard-pressed to ever leave such a gorgeous space!